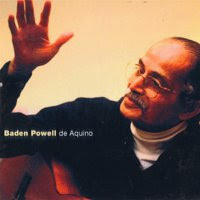 Baden Powell de Aquino (August 6, 1937 - September 26, 2000) widely known simply as Baden Powell, was a Brazilian guitarist. He performed in many Latin music styles, including Bossa nova, Samba, Brazilian jazz, Latin jazz and Música Popular Brasileira.Baden Powell de Aquino was born in Varre-e-Sai in the state of Rio de Janeiro, Brazil. His father, a scouting enthusiast, named him after Robert Baden-Powell. When he was three, his family relocated to a suburb in the city of Rio de Janeiro. The new surroundings proved profoundly influential. His house was a stop for popular musicians during his formative years. He soon started guitar lessons with Jayme Florence, a famous Choro guitarist in the 1940s. He proved a young virtuoso, having won many talent competitions before he was a teenager. At age fifteen, he was already playing professionally, accompanying singers and bands in various styles. As a youngster, he was fascinated by Swing and Jazz, but his main influences were firmly rooted in the Brazilian guitar canon. He first achieved fame in 1959 by convincing Billy Blanco, who was an established singer and songwriter to put lyrics to one of his compositions. The result was called "Samba Triste" and very successful. It has been covered by many artists, including Stan Getz and Charlie Byrd in their seminal LP Jazz Samba. In 1962, he met the poet-diplomat Vinicius de Moraes and began a collaboration that yielded some true classics of 1960s Brazilian music. Although Bossa Nova was the prevailing sound of the times, the partnership Baden-Vinicius wanted to transcend the then-fashionable sound by syncretizing Afro-Brazilian forms such as Candomblé, Umbanda and Capoeira with Rio de Janeiro's Samba forms. The most enduring result is a series released as an LP in 1966 under the name "Os Afro-Sambas de Baden e Vinicius". During those years, he studied advanced harmony with Moacir Santos, released recordings in the Brazilian labels Elenco and Forma, as well as in the French label Barclay and the German label MPS/Saba (notably, his 1966 Tristeza on Guitar, considered by many to be a high point in his career). In addition, he was the house guitarist for Elenco, and Elis Regina's TV show "O Fino da Bossa". In 1968, he partnered with poet Paulo Cesar Pinheiro and produced another series of Afro-Brazilian inspired music released in 1970 as "Os Cantores da Lapinha". He visited and toured Europe frequently in the 1960s, relocating permanently to France in 1968. In the 1970s, he released many recordings with different labels in Europe and Brazil. His star dimmed somewhat owing to health problems and people's changing tastes. He spent the 1980s in semi-retirement in France and Germany. Finally, in the 1990s he and his family moved back to Brazil, where he continued to record and perform. Public recognition of his work came around that time in Brazil. By the end of the 1990s he converted to Evangelical faith, to which he credits overcoming his long addictions to alcohol and tobacco. Nevertheless, his health had greatly deteriorated after many years of abuse, and he fell ill in 2000. Baden Powell died of pneumonia triggered by diabetes on the 26th of September, 2000, in Rio de Janeiro. He is the father of pianist Philippe Baden Powell de Aquino and guitarist Louis Marcel Powell de Aquino.